Story: O'Donnell had just finished some wetwork for an organization when Morgan Stryker contacted him about joining a team for a rescue operation for CIA in Manigua, which he did . O'Donnell stayed with the team until he was killed by a Shu'rii onboard Skywatch on a mission for StormWatch . Skills & abilities: O'Donnel had cybernetic implants which enhanced his skills as a marksman. 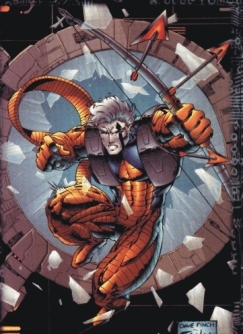 Equipment: Bloodbow's main weapon was the bow with specialized arrows like concussive arrows, stun arrows, and high-intensity plasma flash arrows.